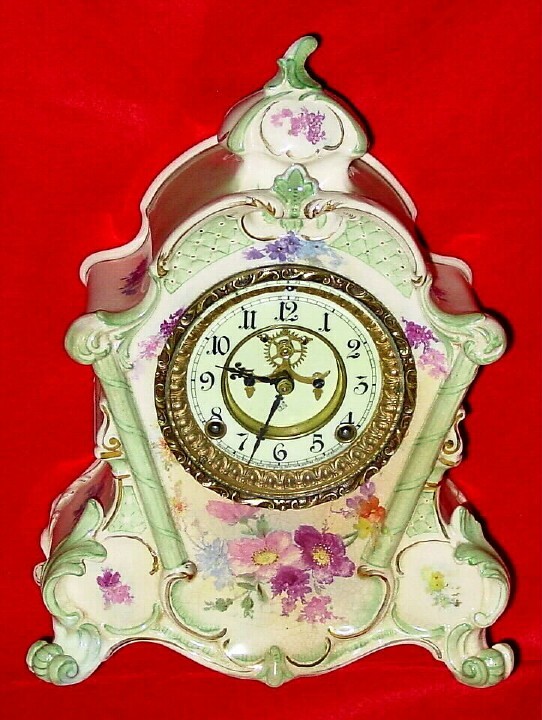 C.1900, Ansonia, Model 502, Royal Bonn porcelain china clock in very good original condition. This would rate outstanding if not for a little discoloration to the case under the dial, probably from over-oiling the movement at an earlier time. The colors on the case are elegantly sublime, a soft green with darker green shadows and gold highlights, and the case has no chips nor cracks. Open escape dial is perfect and with good Bonn trademark on the rear. This clock was cleaned recently (repair sticker) and is in good running order. For details on this hard-to-find model, see Ly\'s Ansonia book (1998), page 628. It is not apparent in the photo, but this case is "pierced" above the dial under the arch. Height 10 1/2"